A bomber-style jacket by BOSS Menswear, cut to a short length in a timeless fit. 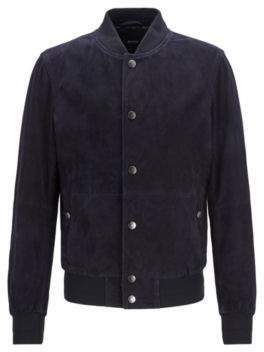 Created in soft and lightweight suede, this contemporary jacket features snap fastenings through the centre front and a ribbed-knit collar, cuffs and hem. This casual design, finished with a metal BOSS badge at the outer back neck, is an essential go-to for cooler summer days.